Filter up to 300 gallons depending on water quality. The Katadyn Hiker Pro is the most widely sold microfilter in the U.S. outdoor market. Includes prefilter removable filter protector, 2 quick connect hose sets, Easy Fill bottle adaptor and carry bag. 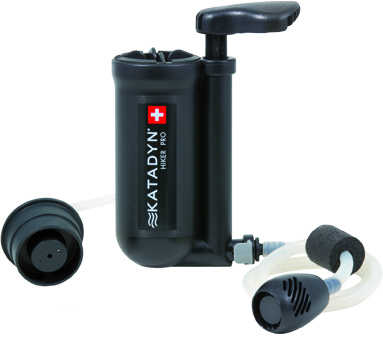 The Katadyn Hiker Pro is a mere 310 grams and reliabily eliminates bacteria, cysts and sediments from water. The filter is very easy to clean on trips thanks to its cleanable filter protector. The filter protector also extends the life of the 0.3 micron glass fiber filter cartridge. Its active carbon filling improves the taste of water and eliminates odors. "Installation and removal of the input and output hoses is child's play thanks to the convenient Quick Connect fittings."